Stochastic Optimization in the widest sense is concerned with optimization problems influenced by random parameters in the objective or constraints. The solution of such problems aims in general at finding cost optimal decisions which at the same time are robust against the effect of randomness. A typical such problem class is defined by so-called probabilistic (or chance) constraints. Here, the decisions guarantee that a given random inequality system (e.g., satisfaction of the random demand of a certain good) is fulfilled at a specified minimum probability. A typical application is the control of a water reservoir under random inflows and bounds for the water level in the reservoir (see picture left). In the context of gas network optimization under random loads, the maximization of free capacities in the nodes under load coverage with given probability plays an important role (see picture right). The mathematical challenge of these constraints consists in the absence of an explicit formula for the occuring probability functions which can be approximated only with a limited precision. This complicates in particular the derivation of important structural properties like convexity or differentiability. A major research topic at WIAS is therefore the derivation of gradient formulae for probabilistic constraints and the development of algorithmic solution approaches on their basis. In another typical problem class, the objective is given as an expectation of a function depending on random parameters. The goal is to develop an algorithm which with high probability gives a good approximation to the minimum of this objective. The main mathematical challenge is to obtain non-asymptotic convergence rates for the proposed algorithm. Such algorithms, developed for stochastic optimization problems, turn out to be efficient for solving complex deterministic problems. The idea behind this approach is usually called "randomization". A deterministic objective function is represented as an expectation of a simple random function. Then, a stochastic optimization algorithm with much cheaper iteration is used to solve the deterministic problem with high probability. A. Bayandina, P. Dvurechensky, A. Gasnikov, Mirror descent and convex optimization problems with non-smooth inequality constraints, in: Large Scale and Distributed Optimization, P. Giselsson, A. Rantzer, eds., Lecture Notes in Mathematics 2227, Springer Nature Switzerland AG, Cham, 2018, pp. 181--215, (Chapter Published), DOI 10.1007/978-3-319-97478-1_8 . Probability functions are a powerful modelling tool when seeking to account for uncertainty in optimization problems. In practice, such uncertainty may result from different sources for which unequal information is available. A convenient combination with ideas from robust optimization then leads to probust functions, i.e., probability functions acting on generalized semi-infinite inequality systems. In this paper we employ the powerful variational tools developed by Boris Mordukhovich to study generalized differentiation of such probust functions. We also provide explicit outer estimates of the generalized subdifferentials in terms of nominal data. A. Gasnikov, P. Dvurechensky, M. Zhukovskii, S. Kim, S. Plaunov, D. Smirnov, F. Noskov, About the power law of the PageRank vector distribution. Part 2. Backley--Osthus model, power law verification for this model and setup of real search engines, Numerical Analysis and Applications, 11 (2018), pp. 16--32, DOI 10.1134/S1995423918010032 . A. Hantoute, R. Henrion, P. Pérez-Aros, Subdifferential characterization of probability functions under Gaussian distribution, Mathematical Programming. A Publication of the Mathematical Programming Society, (2018), published online on 29.01.2018, DOI 10.1007/s10107-018-1237-9 . P. Dvurechensky, A. Gasnikov, A. Lagunovskaya, Parallel algorithms and probability of large deviation for stochastic convex optimization problems, Numerical Analysis and Applications, 11 (2018), pp. 33--37, DOI 10.1134/S1995423918010044 . R. Henrion, W. Römisch, Problem-based optimal scenario generation and reduction in stochastic programming, Mathematical Programming. A Publication of the Mathematical Programming Society, (2018), published online on 04.10.2018, DOI 10.1007/s10107-018-1337-6 . Scenarios are indispensable ingredients for the numerical solution of stochastic programs. Earlier approaches to optimal scenario generation and reduction are based on stability arguments involving distances of probability measures. In this paper we review those ideas and suggest to make use of stability estimates based only on problem specific data. For linear two-stage stochastic programs we show that the problem-based approach to optimal scenario generation can be reformulated as best approximation problem for the expected recourse function which in turn can be rewritten as a generalized semi-infinite program. We show that the latter is convex if either right-hand sides or costs are random and can be transformed into a semi-infinite program in a number of cases. We also consider problem-based optimal scenario reduction for two-stage models and optimal scenario generation for chance constrained programs. Finally, we discuss problem-based scenario generation for the classical newsvendor problem. We consider multistage stochastic linear optimization problems combining joint dynamic probabilistic constraints with hard constraints. We develop a method for projecting decision rules onto hard constraints of wait-and-see type. We establish the relation between the original (infinite dimensional) problem and approximating problems working with projections from different subclasses of decision policies. Considering the subclass of linear decision rules and a generalized linear model for the underlying stochastic process with noises that are Gaussian or truncated Gaussian, we show that the value and gradient of the objective and constraint functions of the approximating problems can be computed analytically. We consider probability functions of parameter-dependent random inequality systems under Gaussian distribution. As a main result, we provide an upper estimate for the Clarke subdifferential of such probability functions without imposing compactness conditions. A constraint qualification ensuring continuous differentiability is formulated. Explicit formulae are derived from the general result in case of linear random inequality systems. In the case of a constant coefficient matrix an upper estimate for even the smaller Mordukhovich subdifferential is proven. R. Hildebrand, Spectrahedral cones generated by rank 1 matrices, Journal of Global Optimization. An International Journal Dealing with Theoretical and Computational Aspects of Seeking Global Optima and Their Applications in Science, Management and Engineering, 64 (2016), pp. 349--397. A.V. Gasnikov, P. Dvurechensky, Y.E. Nesterov, Stochastic gradient methods with inexact oracle, Proceedings of Moscow Institute of Physics and Technology, 8:1 (2016), pp. 41--91. A. Gasnikov, P. Dvurechensky, I. Usmanova, On accelerated randomized methods, Proceedings of Moscow Institute of Physics and Technology, 8:2 (2016), pp. 67--100. A. Gasnikov, P. Dvurechensky, Stochastic intermediate gradient method for convex optimization problems, Doklady Mathematics. Maik Nauka/Interperiodica Publishing, Moscow. English. Translation of the Mathematics Section of: Doklady Akademii Nauk. (Formerly: Russian Academy of Sciences. Doklady. Mathematics)., 93 (2016), pp. 148--151. P. Dvurechensky, A. Gasnikov, Stochastic intermediate gradient method for convex problems with inexact stochastic oracle, Journal of Optimization Theory and Applications, 171 (2016), pp. 121--145. TH. Arnold, R. Henrion, A. Möller, S. Vigerske, A mixed-integer stochastic nonlinear optimization problem with joint probabilistic constraints, Pacific Journal of Optimization. An International Journal, 10 (2014), pp. 5--20. We illustrate the solution of a mixed-integer stochastic nonlinear optimization problem in an application of power management. In this application, a coupled system consisting of a hydro power station and a wind farm is considered. The objective is to satisfy the local energy demand and sell any surplus energy on a spot market for a short time horizon. Generation of wind energy is assumed to be random, so that demand satisfaction is modeled by a joint probabilistic constraint taking into account the multivariate distribution. The turbine is forced to either operate between given positive limits or to be shut down. This introduces additional binary decisions. The numerical solution procedure is presented and results are illustrated. K. Emich, R. Henrion, W. Römisch, Conditioning of linear-quadratic two-stage stochastic optimization problems, Mathematical Programming. A Publication of the Mathematical Programming Society, 148 (2014), pp. 201--221. In this paper a condition number for linear-quadratic two-stage stochastic optimization problems is introduced as the Lipschitz modulus of the multifunction assigning to a (discrete) probability distribution the solution set of the problem. Being the outer norm of the Mordukhovich coderivative of this multifunction, the condition number can be estimated from above explicitly in terms of the problem data by applying appropriate calculus rules. Here, a chain rule for the extended partial second-order subdifferential recently proved by Mordukhovich and Rockafellar plays a crucial role. The obtained results are illustrated for the example of two-stage stochastic optimization problems with simple recourse. W. VAN Ackooij, R. Henrion, Gradient formulae for nonlinear probabilistic constraints with Gaussian and Gaussian-like distributions, SIAM Journal on Optimization, 24 (2014), pp. 1864--1889. Probabilistic constraints represent a major model of stochastic optimization. A possible approach for solving probabilistically constrained optimization problems consists in applying nonlinear programming methods. In order to do so, one has to provide sufficiently precise approximations for values and gradients of probability functions. For linear probabilistic constraints under Gaussian distribution this can be successfully done by analytically reducing these values and gradients to values of Gaussian distribution functions and computing the latter, for instance, by Genz' code. For nonlinear models one may fall back on the spherical-radial decomposition of Gaussian random vectors and apply, for instance, Deák's sampling scheme for the uniform distribution on the sphere in order to compute values of corresponding probability functions. The present paper demonstrates how the same sampling scheme can be used in order to simultaneously compute gradients of these probability functions. More precisely, we prove a formula representing these gradients in the Gaussian case as a certain integral over the sphere again. Later, the result is extended to alternative distributions with an emphasis on the multivariate Student (or T-) distribution. D. Adelhütte, D. Assmann, T. González Grandón, M. Gugat, H. Heitsch, R. Henrion, F. Liers, S. Nitsche, R. Schultz, M. Stingl, D. Wintergerst, Joint model of probabilistic-robust (probust) constraints with application to gas network optimization, Preprint no. 2550, WIAS, Berlin, 2018, DOI 10.20347/WIAS.PREPRINT.2550 . Optimization problems under uncertain conditions abound in many real-life applications. While solution approaches for probabilistic constraints are often developed in case the uncertainties can be assumed to follow a certain probability distribution, robust approaches are usually applied in case solutions are sought that are feasible for all realizations of uncertainties within some predefined uncertainty set. As many applications contain different types of uncertainties that require robust as well as probabilistic treatments, we introduce a class of joint probabilistic/robust constraints. 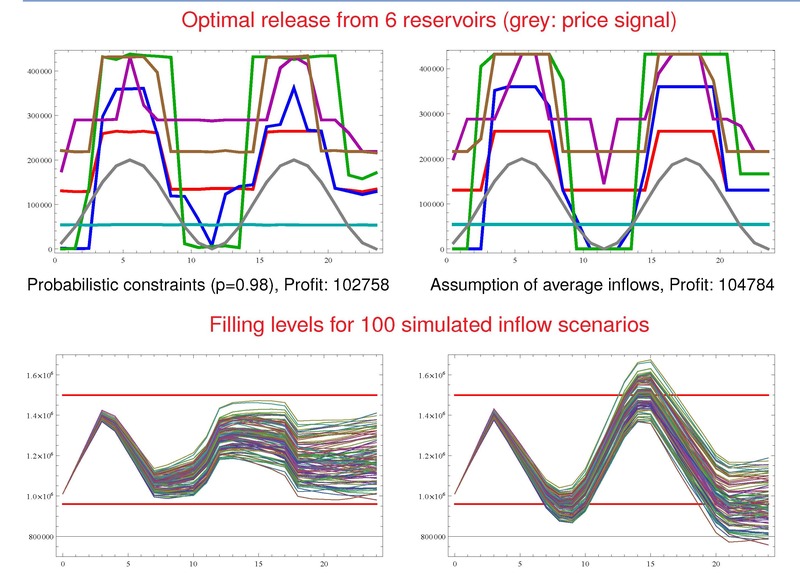 Focusing on complex uncertain gas network optimization problems, we show the relevance of this class of problems for the task of maximizing free booked capacities in an algebraic model for a stationary gas network. We furthermore present approaches for finding their solution. Finally, we study the problem of controlling a transient system that is governed by the wave equation. The task consists in determining controls such that a certain robustness measure remains below some given upper bound with high probability. H. Heitsch, On probabilistic capacity maximization in a stationary gas network, Preprint no. 2540, WIAS, Berlin, 2018, DOI 10.20347/WIAS.PREPRINT.2540 . The question for the capacity of a given gas network, i.e., determining the maximal amount of gas that can be transported by a given network, appears as an essential question that network operators and political administrations are regularly faced with. In that context we present a novel mathematical approach to assist gas network operators in managing uncertainty with respect to the demand and in exposing free network capacities while increasing reliability of transmission and supply. The approach is based on the rigorous examination of optimization problems with nonlinear probabilistic constraints. As consequence we deal with solving an optimization problem with joint probabilistic constraints over an infinite system of random inequalities. 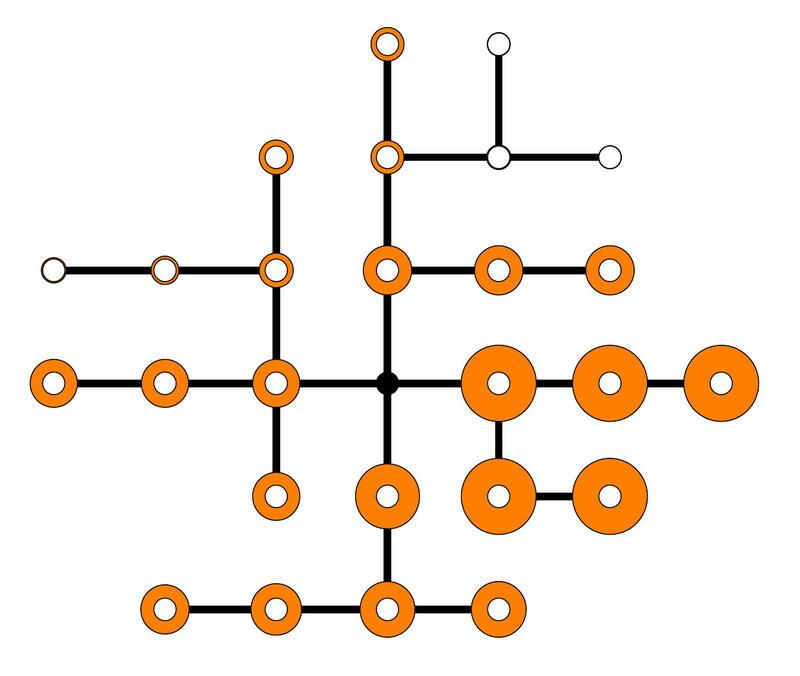 We will show that the inequality system can be reduced to a finite one in the situation of considering a tree network topology. A detailed study of the problem of maximizing free booked capacities in a stationary gas network is presented that comes up with an algebraic model involving Kirchhoff's first and second laws. The focus will be on both the theoretical and numerical side. We are going to validate a kind of rank two constraint qualification implying the differentiability of the considered capacity problem. At the numerical side we are going to solve the problem using a projected gradient decent method, where the function and gradient evaluations of the probabilistic constraints are performed by the approach of spheric-radial decomposition applied for multivariate Gaussian random variables and more general distributions. A. Hantoute, R. Henrion, P. Pérez-Aros, Subdifferential characterization of probability functions under Gaussian distribution, Preprint no. 2478, WIAS, Berlin, 2018, DOI 10.20347/WIAS.PREPRINT.2478 . P. Dupuis, V. Laschos, K. Ramanan, Exit time risk-sensitive stochastic control problems related to systems of cooperative agents, Preprint no. 2407, WIAS, Berlin, 2017, DOI 10.20347/WIAS.PREPRINT.2407 . R. Henrion, Robust control of a sweeping process with probabilistic end-point constraints, Workshop ``Nonsmooth and Variational Analysis'', January 28 - February 1, 2019, Erwin Schrödinger International Institute for Mathematics and Physics, Vienna, Austria, January 31, 2019. H. Heitsch, A probabilistic approach to optimization in gas transport, 2nd Conference on Mathematics of Gas Transport (MoG-2), October 10 - 11, 2018, Konrad-Zuse-Zentrum für Informationstechnik Berlin, October 10, 2018. D. Dvinskikh, Decentralize and randomize: Faster algorithm for Wasserstein barycenters, Thirty-second Conference on Neural Information Processing Systems, December 3 - 8, 2018, Montréal, Canada, December 6, 2018. P. Dvurechensky, D. Dvinskikh, Decentralize and randomize: Faster algorithm for Wasserstein barycenters, Thirty-Second Conference On Neural Information Processing Systems, Montréal, Canada, December 3 - 8, 2018. P. Dvurechensky, Decentralize and randomize: Faster algorithm for Wasserstein barycenters, Thirty-second Conference on Neural Information Processing Systems, December 3 - 8, 2018, Montréal, Canada, December 6, 2018. R. Henrion, Dynamic chance constraints under continuous random distribution, PGMODAYS 2018, Session 1E ``Stochastic optimization'', November 20 - 21, 2018, EDF'Lab Paris-Saclay, Palaiseau, France, November 21, 2018. R. Henrion, Optimization problems under probabilistic constraints, 3rd Russian-German Conference on MultiScale BioMathematics: Coherent Modeling of Human Body System, November 7 - 9, 2018, Lomonosov Moscow State University, Russian Federation, November 8, 2018. R. Henrion, Optimization problems with probust constraints, Colloquium & International Conference on Variational Analysis and Nonsmooth Optimization, June 28 - July 1, 2018, Martin-Luther-Universität Halle-Wittenberg, Halle, June 28, 2018. R. Henrion, Perspectives in probabilistic programming under continuous random distributions, Workshop ``New Directions in Stochastic Optimisation'', August 19 - 25, 2018, Mathematisches Forschungsinstitut Oberwolfach, August 20, 2018. R. Henrion, Probabilistic programming with applications, Universidad Miguel Hernández de Elche, Instituto Centro de Investigación Operativa, Spain, September 13, 2018. H. Heitsch, On probabilistic capacity maximization in stationary gas networks, 21st Conference of the International Federation of Operational Research Societies (IFORS 2017), Invited Session TB20 ``Optimization of Gas Networks 2'', July 17 - 21, 2017, Quebec, Canada, July 18, 2017. P. Dvurechensky, A unified view on accelerated randomized optimization methods: Coordinate descent, directional search, derivative-free method, Foundations of Computational Mathematics (FoCM 2017), Barcelona, Spain, July 17 - 19, 2017. R. Henrion, Contraintes en probabilité: Formules du gradient et applications, Workshop ``MAS-MODE 2017'', Institut Henri Poincaré, Paris, France, January 9, 2017. R. Henrion, On a joint model for probabilistic/robust constraints with an application to gas networks under uncertainties, Workshop ``Models and Methods of Robust Optimization'', March 9 - 10, 2017, Fraunhofer-Institut für Techno- und Wirtschaftsmathematik ITWM, Kaiserslautern, March 10, 2017. R. Henrion, Optimization problems under robust constraints with applications to gas networks under uncertainty, The Eighth Australia-China Workshop on Optimization (ACWO 2017), December 4, 2017, Curtin University, Perth, Australia, December 4, 2017. R. Henrion, Probabilistic constraints: Convexity issues and beyond, XII International Symposium on Generalized Convexity and Monotonicity, August 27 - September 2, 2017, Hajdúszoboszló, Hungary, August 29, 2017. R. Henrion, Probabilistic programming in infinite dimensions, The South Pacific Optimization Meeting in Western Australia 2017 (SPOM in WA 2017), December 8 - 10, 2017, Curtin University, Perth, Australia, December 9, 2017. R. Henrion, Problèmes d'optimisation sous contraintes en probabilité, Université de Bourgogne, Département de Mathématiques, Dijon, France, October 25, 2017. R. Henrion, Subdifferential estimates for Gaussian probability functions, HCM Workshop: Nonsmooth Optimization and its Applications, May 15 - 19, 2017, Hausdorff Center for Mathematics, Bonn, May 17, 2017. R. Henrion, Subdifferential of probability functions under Gaussian distribution, The Second Pacific Optimization Conference (POC2017), December 4 - 7, 2017, Curtin University, Perth, Australia, December 6, 2017. R. Hildebrand, Canonical barriers on convex cones, Oberseminar Geometrische Analysis, Johann Wolfgang Goethe-Universität Frankfurt am Main, Fachbereich Mathematik, April 26, 2016. R. Henrion, (Sub-)Gradient formulae for Gaussian probability functions, XIV International Conference on Stochastic Programming (ICSP 2016), Thematic Session: Probabilistic Constraints: Applications and Theory, June 25 - July 1, 2016, Búzios, Brazil, June 28, 2016. R. Henrion, Aspects of nondifferentiability for probability functions, 7th International Seminar on Optimization and Variational Analysis, June 1 - 3, 2016, Universidad de Alicante, Spain, June 2, 2016. R. Henrion, Aspects of nonsmoothness for Gaussian probability functions, PGMO Days 2016 -- Gaspard Monge Program for Optimization and Operations Research, November 8 - 9, 2016, Electricité de France, Palaiseau, France, November 9, 2016. R. Henrion, Initiation aux problèmes d'optimisation sous contraintes en probabilité, Workshop ``Optimisation en Milieu Aléatoire'', November 8, 2016, Institut des Sciences Informatiques et de leurs Interactions, GdR 720 ISIS (Information, Signal, Image et ViSion), Paristech Télécom, Paris, France, November 8, 2016. R. Hildebrand, Geometry of barriers for 3-dimensional cones, Optimization and Applications in Control and Data Science, May 13 - 15, 2015, Moscow Institute of Physics and Technology, PreMoLab, Moscow, Russian Federation, May 15, 2015. R. Hildebrand, Rank 1 generated spectrahedral cones, Frontiers of High Dimensional Statistics, Optimization, and Econometrics, February 26 - 27, 2015, Higher School of Economics, Moscow, Russian Federation, February 26, 2015. R. Hildebrand , Optimizing strategies in energy and storage markets, Matheon Center Days, Technische Universität Berlin, April 16, 2015. P. Dvurechensky, Stochastic intermediate gradient method: Convex and strongly convex cases, Information Technologies and Systems 2015, September 6 - 11, 2015, Russian Academy of Sciences, Institute for Information Transmission Problems, Sochi, Russian Federation, September 9, 2015. R. Henrion, (Sub-) Gradient formulae for probability functions with Gaussian distribution, PGMO Days 2015 -- Gaspard Monge Program for Optimization and Operations Research, October 27 - 28, 2015, ENSTA ParisTech, Palaiseau, France, October 28, 2015. R. Henrion, Conditioning of linear-quadratic two-stage stochastic optimization problems, Charles University, Faculty of Mathematics and Physics, Prague, Czech Republic, March 26, 2015. R. Henrion, On some relations between probability functions and variational analysis, International Workshop ``Variational Analysis and Applications'', August 28 - September 5, 2015, Erice, Italy, August 31, 2015. R. Henrion, Conditioning of linear-quadratic two-stage stochastic optimization problems, 5th Conference on Optimization Theory and its Applications (ALEL 2014), June 5 - 7, 2014, Universidad de Sevilla, Spain, June 6, 2014. R. Henrion, Gradient formulae in probabilistic programming, Conference on Optimization & Practices in Industry (PGMO-COPI'14), October 28 - 31, 2014, Ecole Polytechnique, Paris, France, October 29, 2014. R. Henrion, Gradient formulae in probabilistic programming, Université Paul Sabatier, Laboratoire d'analyse et d'architecture des systèmes, Toulouse, France, December 8, 2014. R. Henrion, Probabilistic constraints: A structure-oriented introduction, Optimization and Applications Seminar, Eidgenössische Technische Hochschule Zürich, Switzerland, September 29, 2014. R. Henrion, Problèmes d'optimisation sous contraintes en probabilité: une initiation, December 9 - 10, 2014, Université Paul Sabatier, Institut de Mathématiques de Toulouse, France. We consider smooth stochastic convex optimization problems in the context of algorithms which are based on directional derivatives of the objective function. This context can be considered as an intermediate one between derivative-free optimization and gradient-based optimization. We assume that at any given point and for any given direction, a stochastic approximation for the directional derivative of the objective function at this point and in this direction is available with some additive noise. The noise is assumed to be of an unknown nature, but bounded in the absolute value. We underline that we consider directional derivatives in any direction, as opposed to coordinate descent methods which use only derivatives in coordinate directions. For this setting, we propose a non-accelerated and an accelerated directional derivative method and provide their complexity bounds. Despite that our algorithms do not use gradient information, our non-accelerated algorithm has a complexity bound which is, up to a factor logarithmic in problem dimension, similar to the complexity bound of gradient-based algorithms. Our accelerated algorithm has a complexity bound which coincides with the complexity bound of the accelerated gradient-based algorithm up to a factor of square root of the problem dimension, whereas for existing directional derivative methods this factor is of the order of problem dimension. We also extend these results to strongly convex problems. Finally, we consider derivative-free optimization as a particular case of directional derivative optimization with noise in the directional derivative and obtain complexity bounds for non-accelerated and accelerated derivative-free methods. Complexity bounds for these algorithms inherit the gain in the dimension dependent factors from our directional derivative methods. We consider an unconstrained problem of minimization of a smooth convex function which is only available through noisy observations of its values, the noise consisting of two parts. Similar to stochastic optimization problems, the first part is of a stochastic nature. On the opposite, the second part is an additive noise of an unknown nature, but bounded in the absolute value. In the two-point feedback setting, i.e. when pairs of function values are available, we propose an accelerated derivative-free algorithm together with its complexity analysis. The complexity bound of our derivative-free algorithm is only by a factor of n??? larger than the bound for accelerated gradient-based algorithms, where n is the dimension of the decision variable. We also propose a non-accelerated derivative-free algorithm with a complexity bound similar to the stochastic-gradient-based algorithm, that is, our bound does not have any dimension-dependent factor. Interestingly, if the solution of the problem is sparse, for both our algorithms, we obtain better complexity bound if the algorithm uses a 1-norm proximal setup, rather than the Euclidean proximal setup, which is a standard choice for unconstrained problems.